Keep the secret! an enchanting place for enjoying a drink in Montmartre! Pink, green, purple, A very colorful street paris! Crémieux is a very unusual street that you will find nowhere else. Posted in Hidden ParisTagged Hidden ParisLeave a Comment on Pink, green, purple, A very colorful street paris! Passage Jouffroy is full of shops selling toys, Oriental furnishings, and cinema books and posters. Not to mention the Grevin Museum and the hotel Chopin a historic and cheap hotel.Finally, after visiting or shopping, if you’re feeling peckish, check out a little pastry shop called “La Tour des Delices” at the end of the passage. 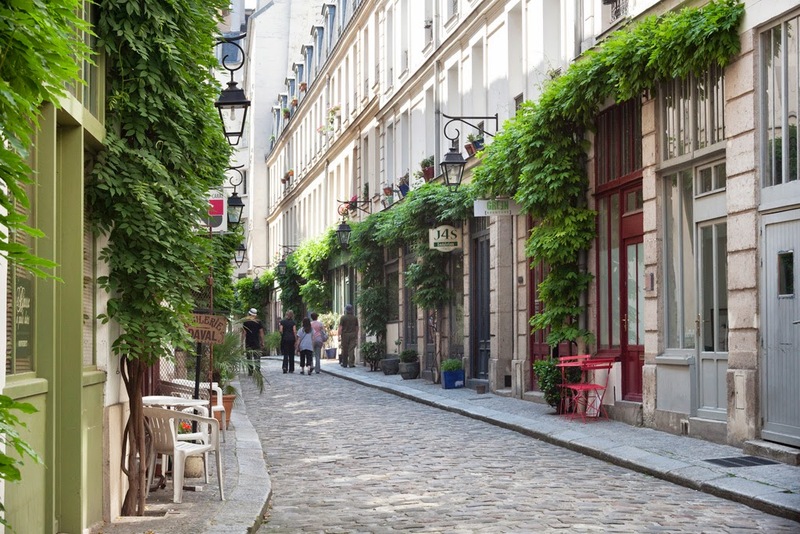 Access by the lovely Cour du Commerce (by Saint André des Arts’s street in the 5th district) where you’ll find the famous restaurant Procope and a lovely tearoom called La Jacobine. La Cour de Rohan is one of my favorite passages in Paris. Hundred of people wander in the St André des Arts’s street every day and miss this secret passage.